The Les Amis Fencing Club is pleased to announce its residency at the Gloria J. Parks Community Center. Starting February 2009, Buffalo’s oldest and longest funning fencing club moved locations into the University District of Buffalo. The Club brings its love of fencing to the young and old and is happy to be sharing space at the Gloria J. Parks Community Center. Fencing is the sport of swordplay. It combines the mental challenge of one-on-one competition with physical agility and endurance. It’s a great aerobic activity that will help build balance, strengthen your endurance and sharpen your wits. 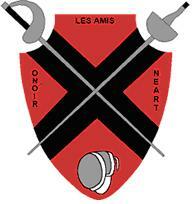 Les Amis Fencing Club is rooted in the art of classical foil fencing in the French style. We provide our members and the community with the opportunity to learn, grow, and compete from that foundation. We also encourage personal honor, inner strength, grace, respect and courtesy. Beginner and Intermediate classes are offered for individuals 14 years old and up, and you’re never too old to try. Equipment is provided and the Beginner class only costs $50 for 8 weeks of lesson. The Salle is open Mondays and Wednesdays from 7 PM to 10 PM, Tuesdays and Fridays from 8:30 PM to 10 PM, and Saturdays from 5 PM to 7 PM. If you’re a current member of the Community Center and have wondered who are those people carrying swords around, feel free to talk with us. We’re eager to meet our neighbors. If you’re a member of the community or just curious about fencing, then come visit us some night. Buffalo has a growing fencing scene with more people of all ages joining every year. We’re excited to be part of the Gloria J. Parks Community Center and invite everyone in the community to come down to our Salle. You’ll get some good exercise, learn new skills and make some great friends. Visit our website at www.lesamisfencing.org to learn about the club and fencing.